whoa!! This is pretty!! very awesome resist!! love it!! 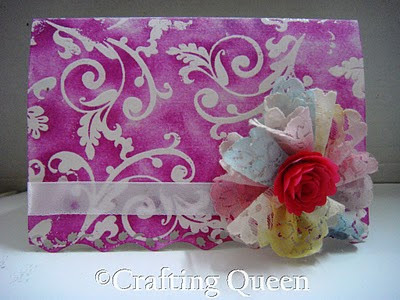 ooooh.. the resist and pink combo have turned out so well.... beautiful and elegant!! Niiice! Came out very well indeed! :) Like your flowers! Great work! u're a pro at the emboss resist technique! lovely card, love the swirls and the flowers!